Any Appointfix app user or Facebook fan over the age of 18 from the USA, Canada, Australia, UK or anywhere else in the world can participate in the contest. Everyone’s welcome! In the comment section below: post a couple picture (you and your partner:) + tag your sweetheart + include the hashtag #AppointfixLOVE. OR, if you don’t like photos or can’t upload one for whatever reasons, you can: write in the comment section a beautiful declaration of love to your partner + tag your sweetheart + include the hashtag #AppointfixLOVE. The prize is a monetary gift of $200 in cash, which the winner can spend on a romantic dinner for two at the restaurant of their choice. It’s our way of celebrating #AppointfixLOVE this February, offering the nice romantic gift to the fortunate Appointfix user/fan who wins the contest. The Valentine’s Day contest ends on Sunday, 17 February 2019 at midnight. All the participants will be entered in a raffle and the winner will be fairly decided with www.random.org, and announced on Appointfix Facebook page on February 18th, 2019. Make sure you like Appointfix Facebook page to see who the winner is and find out about future fun promotions. How will the winner get the prize? The $200 cash will be sent to the winner through PayPal (preferably), Revolut or wire transfer. The contest entries (pictures and comments) must be decent and respectful, otherwise they won’t be included and will be deleted from the page. This contest is for all our clients, users and fans who have a Facebook account. If you’re not on Facebook, we’re sorry but you won’t be able to participate for technical reasons (you won’t have the option to add a comment and upload a picture). The participants will have to be logged in on Facebook in order to post pictures and comments on our blog page in the comment section below. The contest runs on our blog and Appointfix Facebook page. All the participants who followed the rules will be entered in the raffle, and one winner will be selected for the $200 cash prize. The contest is organized by Appointfix. This promotion is in no way sponsored, endorsed or administered by Facebook. Here’s our Valentine’s lovey-dovey gift for you to celebrate LOVE in style. 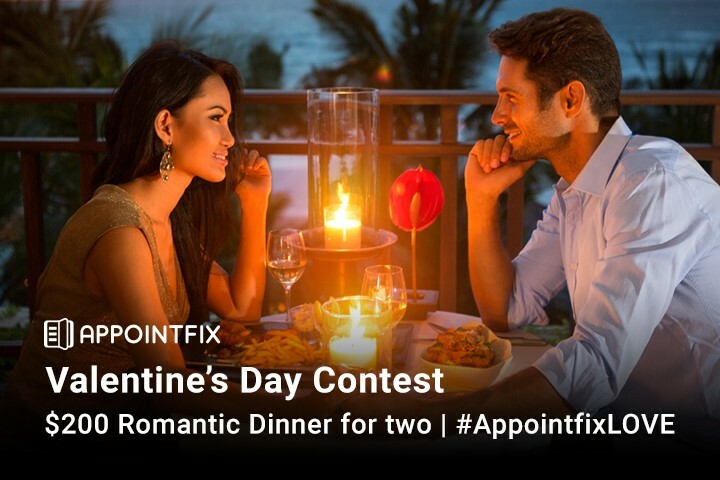 Go ahead and participate in our #AppointfixLOVE contest and win the lovely $200 romantic dinner for two at the restaurant of your choice! Post in the comments below that great picture of you and your sweetheart, and don’t forget to tag him/her too + add the contest hashtag #AppointfixLOVE. Your other half can also participate in the contest sharing a different picture message, which will double your chances to win. Feel free to share about it with your Facebook friends too! You might be super enthusiastic and so in love that you’ve already rushed to participate in the contest. If you’re still reading this though, do you know one of the greatest stories regarding Valentine, the Saint who is celebrated on February 14th? Valentine, a doctor who later became a Catholic priest, lived in Rome in the 3rd century. During that time Emperor Claudius II outlawed marriage for young men. He wanted many soldiers for his army, and his (absurd) reason for outlawing marriages was that single men make better soldiers than the men who have families at home. Priest Valentine seeing the unfair and absolutely ridiculous decree of the Emperor, performed marriages in secret for couples who were in love. He risked his life for doing it and when he was discovered, the Emperor Claudius ordered that Valentine would be imprisoned, then killed. He was martyred on 14 February 270. A couple hundreds of years after his death, February 14th started to be celebrated as the feast day of St. Valentines, the saint patron of love. So February has been celebrated as the month of romance for a long time. During the Middle Ages, people believed that the middle of February was the beginning of birds mating season, so there’s another reason that Valentine’s Day on February 14th got to be a day of celebrating love and romance. Now that you know all this, you’re a little more prepared to celebrate Valentine’s Day this year. If you’re single though, stay tuned and keep following our Facebook page as we’ll soon have some other opportunities and cool giveaways not involving couples. Whether single or in a relationship, may you learn more about LOVE this season and be filled with joy!